Our panel of Technical Experts is back to help make your iGEM experimental planning, execution and troubleshooting easier! In our first webinar, iGEM Crash Course, we discussed experimental basics. Now that your work for the competition is progressing, we know you have questions about more advanced topics. Join us for our second LIVE iGEM Q&A Webinar where our panelists will answer your questions about advanced techniques, including CRISPR. 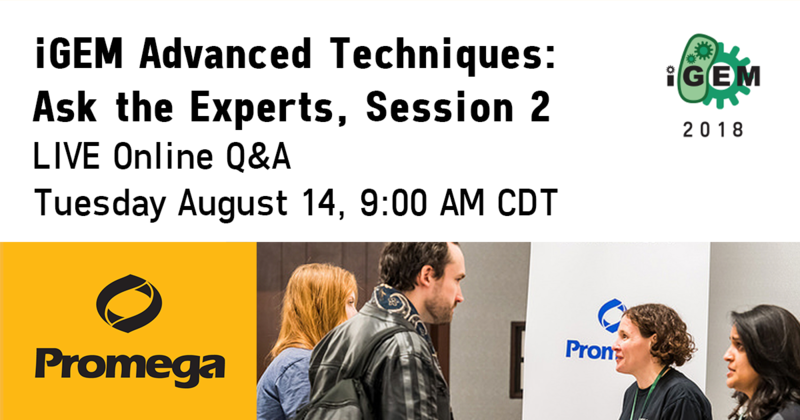 Submit your technical questions when you register for the webinar or during the live webinar via chat. Questions submitted by July 20, 2018 will be guaranteed to be featured in the presentation. Click here to view the video on demand! Symbiosis. At Promega, as in biology itself, we believe that mutual advancement can only be achieved by working in harmony. The best benefits we receive come from the prosperity of our communities. For us, this often means fostering education and advancement of the next generation of scientists and innovators – all of you iGEMers. Promega Corporation is proud to build a new symbiotic bond with young scientists and the synthetic biology research community by becoming a Partner of the iGEM Competition in 2018. Learn more about our resources for iGEM teams! Promega has announced the 10 recipients for their team sponsorship offer! Congratulations to the following teams: Unesp Brazil, RDFZ-China, UI Indonesia, TecMonterrey GDL, Makerere Uganda, NYU Abu Dhabi, Manchester, Edinburgh OG, Tacoma RAINmakers, and Stony Brook. Recipient teams will be contacted directly by Promega. Get up to $2,000 in free product and unparalleled technical support! Promega is proud to announce its plan to support global iGEM teams in 2018 in two important ways. First, we plan to sponsor 10 iGEM teams from throughout the world by providing each team with up to $2,000 in free Promega products. Second, we will offer unparalleled technical, product, and customer support to all competitors as they build their genetically-engineered machines and seed their scientific careers. Promega has 16 local branches and >70 distributors spread throughout the world to help provide iGEM participants with the support that they are seeking. What can you get for $2,000? NOTE: Teams that receive the $2,000 in free Promega product award are still eligible to receive support from their local Promega branch or distributor. Looking for quick tips and tricks, guides, and webinars right now, check out our links below or look at our website www.promega.com. Finding the resources and help that you need when your experiment is not working can be a challenge. Promega is here to help you get through these challenging times and experiments. We have Technical Support Scientists available throughout the world to help troubleshoot and answer questions on anything related to science, well maybe not anything. With 16 local branches and >70 distributors spread throughout the world, Promega is here to help you. 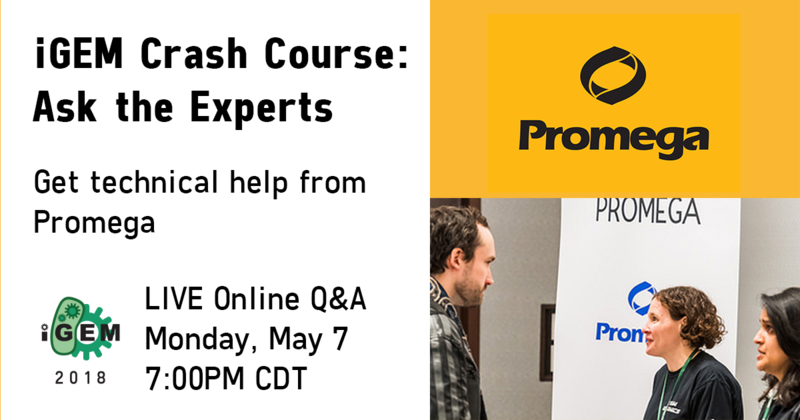 On Monday, May 7, Promega and iGEM held the first LIVE Q&A Workshop exclusively for 2018 iGEMers. Teams were invited to register and submit their technical troubleshooting questions. We covered cloning, ligation, mutagenesis and several other tricky protocols. Promega provides innovative and technical support to researchers, technicians, and analysts in life sciences, industry and government. We offer 3,500 products to enable scientists worldwide to advance knowledge in the fields of genomics, proteomics, cellular analysis, molecular diagnostics, human identification and applied biotechnology. Founded in 1978, the company is headquartered in Madison, WI, USA with sales branches in 16 countries, over 50 global distributors, and manufacturing branches in San Luis Obispo, CA, USA; Shanghai, China; and Seoul, South Korea. Our business is life science, but our lives are fueled by curiosity and life-long learning, and we couldn’t be more proud to learn alongside you intrepid iGEMers in 2018.